Oil. Black gold. Crude. That's what it's all about. Offshore drilling has received much attention since as early as the late 1800s when oilmen noticed that the best producing wells were nearest the ocean. 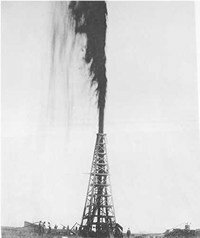 Since the gusher at Spindletop in Beaumont, TX, in 1901, fortunes have been won and lost and lives changed because of oil. The quality of our lives have been permanently pegged to crude oil prices. New technologies and innovations, such as advances made in directional drilling, have spurred offshore exploration. Today, 10% of our nation's domestic oil production and 13% of natural gas production comes from the Gulf of Mexico. The Bureau of Ocean Energy Management, Regulation and Enforcement, estimates that certain areas off the Pacific and Atlantic coasts contain 14.3 billion barrels of oil and 55 trillion cubic feet of natural gas. More than 242,000 jobs nationwide are supported by the offshore industry. Offshore drilling shares the same concept as land based drilling but requires different equipment and personnel. Because these oil rigs are placed offshore in an environment much more harsh, different types of oil rigs are used. One type is the platform rig - a stationary offshore oil or gas production facility. Another type is the jack-up rig. These rigs can be moved and are self-elevating. These drilling rigs are equipped with legs that can be lowered to the ocean floor until a foundation is established. Inland barge rigs are used to drill in shallower depths and for well workover. These oil rigs are self-contained, mobile, drilling/workover rigs. Offshore rigs are like a small community including a cafeteria, laundry facilities, sleeping quarters and management facilities, and employees usually receive a higher salary than land-based employees. The costs are high. For example, oil companies can employ a land based rig for $10,000 to $20,000 per day, but an offshore oil rig costs $200,000 per day or more. The craft of offshore oil drilling is, in concept, no different from land based drilling. It employs directional drilling and attention is paid to BHA. The same type of rock drill bits are used in offshore and land-based drilling - button bits, tooth bits and pdc bits. Because of the extremely high costs of oil production, companies demand that all rock drill bits be of the highest quality. Making an unnecessary bit trip is unacceptable. For this reason, rock bit manufacturers employ the best tricone bit design engineers and spend hundreds of thousands of dollars in research and development of pdc cutters.